Give Your Group the Best Time Ever with Sailing Team Building Programs! Sailing is the perfect platform for developing and refining leadership skills through our corporate sailing events. Team building sailing courses encourage individuals to work together as harmonious teams and give clients, employees and co-workers a liberating way to refresh and spend quality time together. Continue reading to learn more about our team building retreats in Florida and BVI. Steve and Doris Colgate’s Offshore Sailing School provides inspiring and fun getaways, with sailing executive team building and leadership training programs at corporate friendly resorts on the West Coast of Florida, and the British Virgin Islands. A variety of options and formats are available for sailing team building programs, ranging from short breaks under sail, to empowering half-day or full-day Corporate Sail-Race Challenges®, to intense week-long adventures under sail. Whichever location you choose, an on-water corporate sailing event with Offshore Sailing School provides hands-on team building sailing with coaches dedicated to giving your group the best time ever. Not only will they learn to successfully sail and manage a boat together, they will have fun. performance. 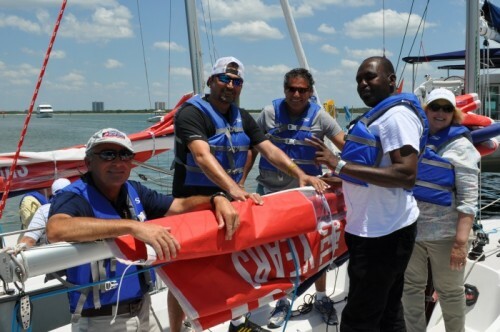 Add sailing executive team building to a Continuing Education program for professionals. Or just give your group a break from all the hard work they do with a couple of fun hours under sail by scheduling corporate sailing events with Offshore Sailing School. Whichever you choose for your employees, co-workers or clients – you will be a hero.